The perceived connection between a developing embryo and the theory of evolution is based entirely on intuition. Some observations include similarities in embryos between species that are presumed to be related (homology), perceived imperfections of embryonic/fetal development, and features in embryos that are believed to suggest an evolutionary past. There is no science whatsoever to validate if any of these hunches are accurate. Ultimately, it is assumed that these observations are inconsistent with creative design. On a personal note, the study of embryology in medical school for me was the single most convincing evidence of the impossibility of evolution. 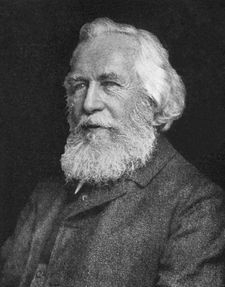 In 1866 Ernst Haeckel, a famous German naturalist, proposed that the evolutionary history of an organism could be seen by looking at the developing embryo/fetus. Although this theory has been universally rejected by embryologists today, his ideas persist. Evolutionary biologists continue to site as “evidence” of evolution that human embryos pass through primitive stages somewhat analogous to our presumed evolutionary ancestors. In the embryologic development of the human eye, for example, it is pointed out that the developing eye starts out as an invagination or in-folding of germinal tissue comparable to the cup-shape of primitive eyes of some mollusks. It is of interest to note that the actual tissues in these structures are unrelated. In other words, the comparison is only superficial. In a respected college textbook, Molecular Biology of the Cell, the authors state that the embryos of divergent species "often resemble each other in their early stages and, as they develop, seem sometimes to replay the steps of evolution.” Here the authors cannot resist the citation as evidence for evolution a process that is deemed false by almost all embryologists. A related argument that is advanced in favor of evolution is that in very early embryonic development, divergent species superficially resemble each other. To many, this provides compelling evidence for evolution. The argument that embryology provides evidence for evolution cannot be presented as scientifically logical because prenatal development is one of the most mysterious of all phenomena in nature. No suggestion can be made as to what an intelligently designed embryo would look like, or why observations of embryology are inconsistent with intelligent design. How a creator should have produced an infant differently than what occurs in nature has yet to be proposed. Why an intelligently designed human shouldn't go through progressive stages in its development from one cell to a fully developed fetus is unexplained. As with all primary evidences for evolution, ultimately philosophical assumptions regarding an intelligent creator are made to justify pre-drawn conclusions. It must be appreciated that before the understanding of inheritance of coded information, scientists were ignorant as to how a single cell developed into a human. The intuitions of many nineteenth century scientists have been proven false with the discovery of DNA in 1953. Whatever similarities might exist between embryos of divergent species, such superficial resemblances are irrelevant. The relentless insistence by evolutionary biologists that superficial embryonic resemblances have any relevance to evolution is troubling. Regardless of any superficial resemblances between species, a developing human is genetically a human at the moment of conception. Every complexity of an adult human being is found in the DNA of a single-celled embryo. As obvious a fact that this is to biologists today, no concept of coded genetic information existed in the nineteenth century. One hundred and fifty years ago many biologists believed that if an embryo looked like a primitive life form, it was a primitive life form. Other evidences cited in embryology include perceived imperfections in prenatal development, suggesting that embryology shows a lack of intelligent engineering. In presenting evidence for evolution, Dr. Sutera notes that a whale embryo develops rear limb buds which later regress before birth. He concludes that this indicates a lack of engineering by a "perfect designer" and reasons that evolution is therefore the only logical explanation. Dr. Sutra has no knowledge as to how to genetically program a whale or any other form of life. He is drawing a conclusion on a hunch based on his subjective logic. It is obvious from the above statement that Dr. Sutera has philosophical problems with the way that embryos form in the context of creative design. Dr. Sutera supposes that an embryo should achieve its adult appearance sooner than occurs in nature. This unscientific logic is advanced as evidence for evolution. This is a very common argument presented to argue that embryology points to evolution. Philosophical observations may be used to propose a scientific hypothesis. However, a hypothesis must be tested. One cannot defend a hypothesis with philosophical arguments. False concepts of biology have been proliferated for decades in biology curricula. 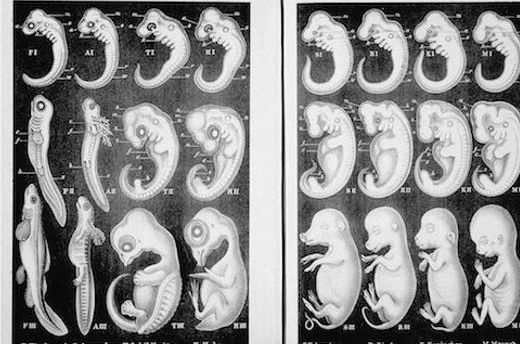 Even today, evolutionary biologists consistently make a false comparison between human embryos and embryos of other life forms. 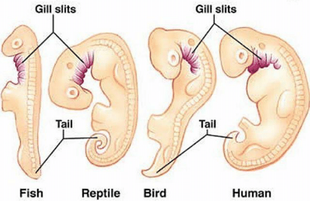 Human embryos, bird embryos and reptile embryos do not have gill slits. The human embryo does not have a tail. Even if it did, this would not prove that humans evolved from other life forms. "We may cease marveling at the embryo of an air-breathing mammal or bird having branchial slits and arteries running in loops, like those of a fish which has to breathe the air dissolved in water by the aid of well-developed branchiae." From the above commentary, Darwin argued that the pathway of embryonic development of a human’s neck demonstrates superficial homology with gills, the inference being that such a pathway is inconsistent with intelligent design. The argument of embryology supporting evolution is similar to the argument of homology. It is supposed that if species were created under the direction of an intelligent designer, three-week old embryos would look more like adults and would not go through stages that later regress. [if evolution were not true]…"why should the embryos of birds and mammals develop gill slits, like fish embryos?" In asking “why gill slits should exist in embryos, both Mayr and Dobzhanski, are comparing a model of evolution to how they believe a God would have designed embryos. It is also noteworthy that these two central figures in evolution argue that man evolved from fish by using a false comparison. The “gill slits” in human embryos are neither “gills”, nor “slits”. They are precursors to the bones of the maxilla and jaw, middle ear canal, muscles of the face, hyoid bone and thymus. Founded on a hunch, they reasoned that a creator would not make a human embryo to look like it has gills. Even though the pharyngeal arches [“gill slits’] have nothing to do with respiration, it is presumed that the superficial appearance provides compelling evidence that man descended from fish. If their hunch is correct, they have no explanation as to how several unrelated organs with unique functions, formed by separate primordial cell lines, could have gradually evolved from gills. The comparison of pharyngeal arches to gill slits is a throwback from the nineteenth century, when biologists thought that human embryos went through a stage with gills. Despite the modern understanding of embryology, evolutionary biologists continue to make the same embarrassing comparison, while today’s embryologists see no relevance whatsoever. Since all animals including humans begin embryonic development from a single cell, the existence of some similarities of three-week old embryos should not be surprising and construed as evidence for evolution. No paper has documented any scientific evidence that evolution has relevance to embryology. In fact, no specific proposition has been made aside from metaphysical arguments. Other evidences in embryology presented as evidence of evolution include the fact that in very early development a human embryo looks like it has a tail. It is concluded that the only logical explanation is that man's ancestors had a tail. Such an extrapolation is ridiculous, particularly in view of the fact that the structure is not a tail, but represents the early development of the spinal column. Some snake and whale embryos possess leg "buds" which regress prior to full development of the fetus. It is concluded that this indicates that their ancestors possessed legs. Baleen whales have teeth during fetal development. This is used as evidence that their ancestors had teeth. Rarely horses are endowed with vestigial "toes". These are presumed to indicate an evolutionary past. The precise logic for such a conclusion amounts to nothing more than intuition. Such reasoning presupposes knowledge about something about which man knows very little... how a species can be programmed to differentiate from a single cell to a fully developed infant. Opinions such as these presume that an intelligent creator would not allow any mistakes to occur in reproduction of species. The contention that embryonic vestigial structures such as rear limb buds in whale embryos are indicative of an evolutionary past is based entirely on a perceived disproof of intelligent design. Such a conclusion requires the assumption that an intelligently designed species would be genetically programmed from scratch in a manner that would be consistent with man's logic as to how creation would have been conducted. All of these arguments are extremely superficial and justified exclusively by metaphysical presuppositions. When pressed to justify their conclusions, leading evolutionary biologists have clearly articulated that embryology points to evolution only because they believe that nature shows a lack of intelligent planning. All that can be assumed is that there would be no reason for an all-powerful God to endow embryos with remnants of non-functioning body parts that will regress and disappear prior to birth. Even if evolutionists insist that their metaphysical arguments are valid, they cannot prove, even from a religious point of view, that their conjectures are correct. To assert that embryonic development of a whale is imperfect would require the production of a superior genetic code that would properly direct the development of a whale in a manner that is superior than what exists. Such a suggestion is utterly unthinkable, given man’s near complete ignorance as to how any novel genetic code could be written.